Late Febuary and March offer some of the best Fishing the Michigan has to offer, before the crowds arrive. As for being a fishing guide in Western Michigan for nearly 25 years, there are always several reoccurring questions that I often get from clients that are interested in Michigan Spring Steelhead fishing. Probably the most resounding question I get the most often is, What is the best river to fish, and when? That is a That is a very legitimate question for sure! Typically, the rule of thumb is to fish from South (Michigan) to North. As a general rule, the rivers in the southern portion of the Michigan warm first, getting the first migrations of Spring Steelhead. Generally the St. Joseph and the Grand River kick off our Michigan Spring Steelhead. This is most often associated with water temperature. Most Steelhead migrations begin around 36 – 38 degrees. Active spawning begins near 42 degrees. Based on water temperatures, the White River in Hesperia, Rogue River in Rockford, and the Pere Marquette River located in Baldwin, are going strong by late February and early March. I have often witnessed steelhead spawning in these rivers on valentines day if we’ve had a couple warm, sunny days. These rivers are smaller and warm more quickly than the larger rivers, offering early Spring Steelhead fishing. 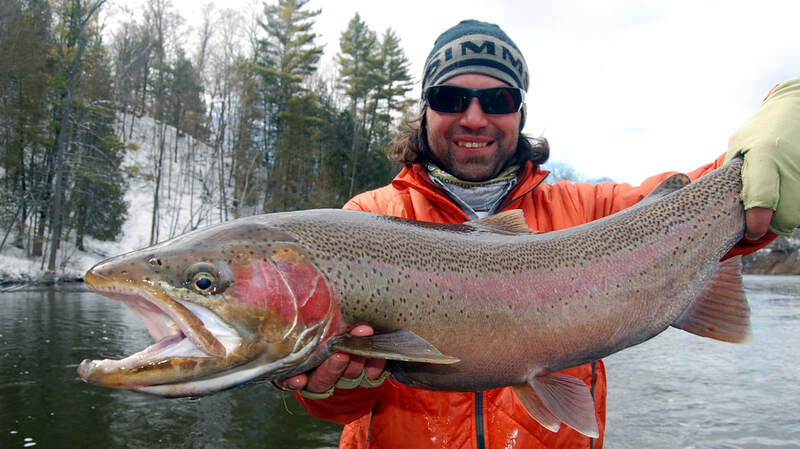 Spring offers some of the best steelhead fishing in Michigan. Its short but sweet! Warm sunny days are the best! Ashley with a gorgeous Spring Steelhead in Michigan Muskegon River. The second set of rivers is a big more complicated, the Big Manistee River, and the Muskegon River located in Newaygo, are a bit more difficult to pin down. Because these rivers are tail water fisheries, the reservoir that holds the water generally has a thick layer of ice on the back water. The ice keeps these rivers much colder than others. Basically, ice cubes in your glass of water keep it cold until the ice melts. These rivers predominately get a big push of steelhead in later march, with peak being later April. The Big Manistee River and the Muskegon River usually have a fishable number of Steelhead until mid to late May, often until Memorial Day. The third section of Michigan Spring Steelhead rivers are your most Northern rivers, Betsie river, Platt, Borgman River, Elk Rapids, and the St. Mary’s Rapids. These rivers always have later runs of steelhead. The water is clear and cold. The St. Mary’s Rapids has Steelhead well into June. Peak times are just after Memorial Day. There are no hard, fast rules on choosing what river will be best for Michigan Spring Steelhead Fishing, however, these tips may certainly improve your odds. Paying attention to Spring run off, and water temperatures are your best bet but this list of rivers should also help. Here are a couple links for Fishing Reports for Michigan Spring Steelhead fishing as well. Spring Steelhead Trips for the Pere Marquette, Manistee, and Muskegon River. $395 for 2 anglers Full Day. $495 for 3 anglers Full Day. Fall Steelhead fishing available now Big Manistee River – Pere Marquette – and Muskegon River Steelhead!